I no longer remember where I first came across it, but I have kept some version of the above image in my journal for many years now. It is one of the lenses I apply to clarify my own thinking around what exactly I am doing and whether or not I am focusing my efforts in the right places. My aspiration is to change the organizational paradigm relative to diversity and inclusion, which means getting my hands on those values (espoused and actual), norms, underlying assumptions, etc., all of which organizations are a bit guarded with, so I often start somewhere else. This model is simpler, and more accessible, yet similar to a really wonderful paper written called Leverage Points: Places to Intervene in a System, written by Donella Meadows in the late 90s. When you step back and take a look at everything you are doing in the name of diversity and inclusion, where would it plot on this continuum? Tools are great. Strategy is great. 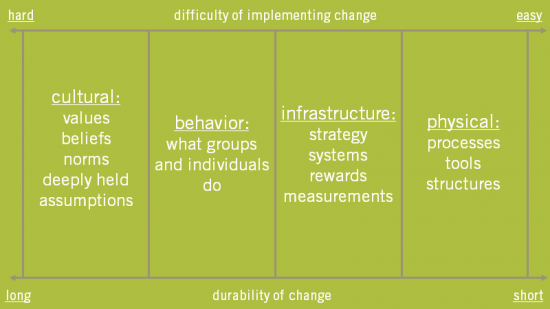 Behavior change can make a huge impact, but if you are not, at the same time, pushing on the cultural stuff – those other efforts are not likely to have the impact they could, and they are a lot less likely to be sustainable. For those of you that are working on the cultural stuff, what do you use? Most of my work in that area involves language, narrative, stories, relational experiences. What tools do you use?